Anita Louise Rice, age 69, of Carrollton, died unexpectedly early Saturday, August 18, 2018 while vacationing with friends in Canada. Born in Union Hospital at Dover on December 15, 1948, Anita was a daughter of the late Raymond P. and Lena C. Bollini Giumenti. Following her graduation from Dover High School, Anita furthered her life long career in learning by earning a bachelor degree from Kent State University. She married her husband, John Rice on July 31, 1971, and together the couple raised two daughters and shared in 43 years of marriage prior to his death on October 22, 2014. For years Anita studied art and painting and enjoyed working in acrylic and watercolor mediums. In celebration of Dover’s 200th Anniversary, Anita was commissioned to be one of the various local artists to paint a section of the mural located in the city’s downtown area. She was a member of the Tuscarawas County Art Guild and enjoying bouncing ideas off of fellow artists. Additionally, Anita worked alongside Werner Geiser for 16 years and learned the craft of woodworking, becoming a master craftsman. She enjoyed building custom furniture on commission for area churches and businesses as well as for family and friends. Anita loved to travel having been fortunate enough to travel extensively throughout Europe and the United States. Her God given talent as a vocalist gave her the opportunity to serve as a soloist and cantor for many years at Our Lady of Mercy Catholic Church at Carrollton. Most recently, she was an active member of St. Joseph Catholic Church at Dover, where she spent her childhood. Among her many activities, Anita loved fishing and was proud to have caught a 26” walleye while on her final trip to Canada. She also loved hosting friends in her home and on her Pontoon boat at Leesville Lake. She will be deeply missed by her daughters, Jennifer (David) Thompsen of Clifton, Illinois and Kelly (Chris) Chaney of Carrollton; her beloved grandchildren, Hannah, Benjamin, Katie and Joe Thompsen and John Chaney; her brother, Charlie (Joyce Smith) Giumenti of Roswell; an aunt, Rena Giumenti of New Philadelphia; sisters-in-law, Virginia C. Rice of New Philadelphia and Peggy (Bill) McFarren of Granville, OH; a brother-in-law, Jerry Decsi of North Carolina and numerous nieces and nephews. In addition to her parents and husband, Anita was preceded in death by her brother and sister-in-law, Gary and Nancy Giumenti; and a sister-in-law, Linda Decsi. The family will greet guests on Tuesday, August 28, 2018 from 2-4 and 6-8 PM in the Linn-Hert-Geib Funeral Home & Crematory at New Philadelphia. A Mass of Christian Burial will be celebrated on Wednesday, August 29, 2018 at 10:30 AM in St. Joseph Catholic Church at Dover. Burial will follow in Sacred Heart’s Calvary Cemetery at New Philadelphia. A meal will follow in St. Joseph’s Family Life Center at Dover. 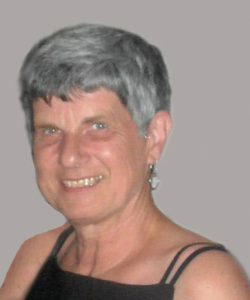 Memorial contributions in Anita’s name may be directed to Sancta Clara Monastery, 4200 Market Ave N, Canton, Ohio 44714. Those wishing to do so may send the family a personal condolence and light a candle in remembrance of Anita by visiting the funeral home’s website at www.GeibCares.com.